We continued the morning sessions at the 2011 Fall Conference with Dr. R.C. 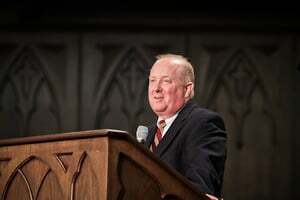 Sproul Jr. speaking on “Lord of Space & Time”. Looking at Matthew 7, Dr. Sproul’s focus was on helping us come to a better understanding of God’s sovereign authority. We read in Matthew 7:1, “Judge not, that you be not judged.” This is a common verse we hear from our unbelieving friends, but God isn’t saying here that we’re not supposed to judge. How can you not judge unless you stop judging the judging of others? Jesus isn’t saying that we are not to judge at all, but He’s telling us to judge carefully and honestly. The danger is that in our judging we fail to be mindful of our own sins because as humans, we are manifesting and reflecting the very character of God. In his Institutes, John Calvin explains that our understanding of God is shaped by our understanding of man. And our understanding of man is shaped by our understanding of God. God is a God of relationship—the Father to the Son, the Son to the Father, and both to the Holy Spirit. This defines who God is and yet we struggle with coming to grasp the unity of the Trinity. Not only is God a God of relationship, but so are we. What is man’s chief end? We know from the Westminster Shorter Catechism that man’s chief end is to glorify God and enjoy Him forever. Oh, if we could only learn to master that. But what is God’s chief end? God’s chief end is to glorify God and enjoy Him forever. That’s what He’s for. That is His purpose. Children can ask a myriad of questions: “How did we get here?” “How did things get to be the way they are?” And the list can go on and on. We can go all the way back to the Garden of Eden with these questions. How did all of creation come to be? What is it’s purpose? To answer these questions, we must go back to the beginning, to the Trinity: God glorifying God and enjoying Him forever. Before all time and creation, the Trinity was complete in and of itself, enjoying and glorifying each other with a complete and absolute joy. But that leads us to a dilemma. If God’s joy was so complete, why did He make the world? When we do things, we do them because of a perceived lack. We eat because we’re hungry. We sleep because we’re tired. But God has no lack—He didn’t create the universe to solve a problem. He created the universe not due to lack but out of manifestation of his lacklessness. The universe is God’s expression for His complete, internal satisfaction and completeness. God is glorious. God is complete, the creation then being a theater of God’s glory. No matter how glorious the message of a theater, the real glory is told in the story found on the stage. The story in the theater of creation is the story of the glory of Jesus Christ, the Lord of space and time. In Scripture, we read of God having a “strong right arm.” That’s a relational term. A strong right arm protects the beloved, attacks the enemy, and is the wing we come under to find comfort and peace. The same is true when we understand that God’s Lordship is not merely a title but a description of His relationship to all of creation. God is not just a glowing ball of power, but God is the judge of heaven and earth. This judging is not merely something God does, but it’s who He is. God speaks and it happens. That’s a manifestation of sovereign power and a strong right arm. In Genesis, the text tells us at the end of each day, God looks at his own work and saw that it was good. As the judge, God pronounces His judgment of blessing. We have a tendency of only thinking of judgment as something guilty. But God’s judgment includes the pronouncement of blessing and peace. In Scripture, we see that God judges from beginning to end. The Fall happens and God shows up. What does he do? He pronounces judgment first to the serpent but then God judges blessing and promise on the woman and her seed. In judgment, God brings promise. We see God show up again with Cain. When God pronounces woe, He pronounces blessing on His people. His judgment on Cain is a vindication of Abel. We see this again and again throughout Scripture with Noah, the tower of Babel, Egypt and the Israelites, and even through the reign of David who, as we read in Psalms, cries out to God to fix the wickedness of the world. After David, we see the rise and fall of kings as God continues His judgment through His prophets until finally the seed of the woman comes. If we want to understand the Incarnation, we have to see the centrality of judgment. “Why the God-man?” asks us to think of all the ways that God could manifest His glory. Some think of hell as merely a contrast for the scope of our redemption in Christ, as a place God sheepishly created to display this contrast. But this is not what Paul says in Romans 9. God wanted to make his wrath known. The God that we worship, the God of the Bible, rejoices to exercise His justice on sinners. The glory of the gospel is that God did not sacrifice judging with justice in order to be able to judge with mercy. God could have winked at our sin by merely passing over our sins. But love won because instead of sacrificing justice, He sacrificed His Son. He not only pronounced Jesus guilty, but exercised His judgment by pouring out the fullness of his wrath. When we think of judgment as only in the negative, we miss who God is.